When working with students on geometry lessons involving angles and lines, I notice many misconceptions. So . . . I thought I would share them with you on this post. Some activity ideas and freebies are located at the end of this post. Students can only see the 90° angle if it is presented in the direction as a capital L.
Try turning the angles in different positions. It is still considered a “right” angle even though it is turned to the left, up, or down. 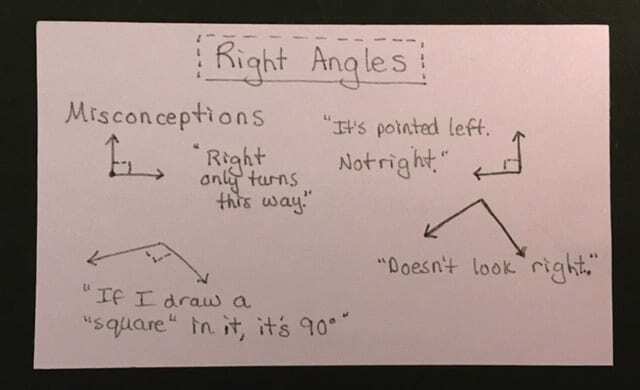 Students are told if they can draw a square inside the angle, then it is a right angle. So if it looks “squarish” to them, they think it’s a right angle. Show them how to put the square corner of a piece of paper or index card into the angle to check. Take time to have them practice – don’t assume they know how. Students often can’t tell if the angle is <90° if it is oriented upside down or if one of the rays is not aligned horizontally. Show how to put the square corner of a piece of paper into the angle to check. If the paper covers up the angle, it is <90°. 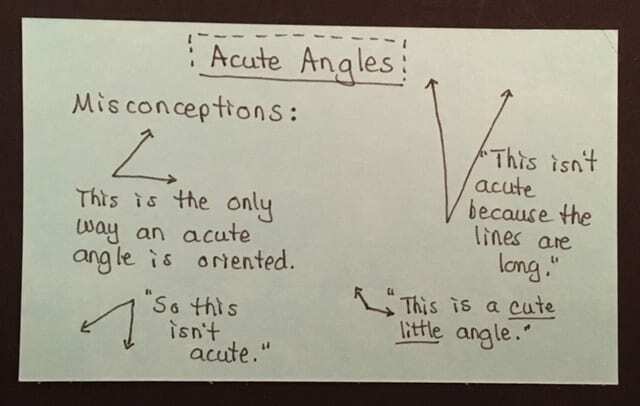 Students are told an acute angle “is a cute little angle.” I am guilty of having done this in the past. But if a student sees any angle made up of short lines, they may interpret it as “little” or acute. Remind them it’s the size of the angle that makes it acute, not the size of the lines. While right angles are exactly 90°, students may expect an acute angle to be given a specific number. Acute angles range from 1° to 89°.